July 20, 2018 Dan O. Lawyers have it tough, man. Tomoaki Shigemori (Masaharu Fukuyama) is a well-known lawyer tasked with defending a client Misumi (Kôji Yakusho), who faces the death penalty if found guilty, in a murder trial. What makes the case so odd isn’t that Misumi has previous convictions for murder, but he has confessed to the crime, leaving Shigemori a little befuddled, wondering just what to do with his client. Does he just give up and allow for the man to have the death-penalty? Or does he try his best to figure out what a murder was committed and hopefully get Misumi off with a life-sentence? Nothing’s really pretty in this situation, but Shigemori won’t stop searching for the truth, no matter how many weird alleys he has to go down. In the past few years or so, I’ve come to the conclusion that writer/director Hirokazu Kore-eda may be one of the best around. His movies, while small, slow, and affectionate, are also expertly-crafted, with subtle writing, wonderful performances, and attention to detail and nuances that we don’t normally see with every director, especially one who seems to never sleep and has at least two movies out a year. While most of his stuff has been character-based dramas, based around ordinary life and everyday going-ons of typical, everyday people, the Third Murder is much more of a procedural, based around a case, the clues, the mystery, and the people involved. It’s as if Hirokazu Kore-eda had been reading a tad too much John Grisham and got a little caught-up in the pulpiness of it all. That said, in anybody else’s hands, the Third Murder wouldn’t work; it’s exceptionally slow, vague, and almost confusing, even despite the fact that the case is pretty shut-and-close. 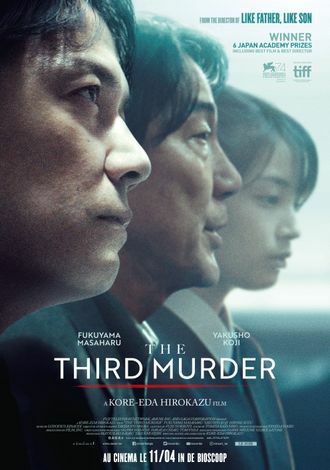 But Hirokazu Kore-eda’s attention to these characters, what drives them, who they are, and why, makes the Third Murder seem like much more than just a simple crime-drama about a shady killer. It’s about more. I think. Mostly, Hirokazu Kore-eda keeps things interesting by giving us small clues, yet, not really telling us all that really need to know. The movie puts us right in the shoes of Fukuyama’s Shigemori who, like us, is just doing what he can to figure out how it all happened and why. Oddly enough, we know how it happened in the first ten minutes, but what makes the Third Murder a step above the usual, is that it isn’t about the how of it all, but the why and the more contradictions we get thrown at us, the more interesting the case becomes. Hirokazu Kore-eda isn’t really interested in why a person would commit such a heinous murder as the one portrayed early-on, but he’s more interested in what a demanding society can do to a man who has been driven past his limits and has no chance but to act out insanely. It makes you think a little bit more and while it’s nowhere near as powerful, as smart, or hell, even as well-directed as some of Hirokazu Kore-eda’s other flicks, it still proves that he’s always got an interesting angle on whatever story he’s telling. And in ways, that’s all we need. Consensus: Though slow and a little too vague for its own good, the Third Murder still finds Hirokazu Kore-eda in his usual form: Relaxed, attentive, smart, and subtle. Remove the glass and just make-out already!